1. What will it be like living in the Bridport Cohousing? In many ways living in cohousing is like living in a traditional neighbourhood or small village. Residents will, to varying degrees, all know one another, socialise together and support each other. To gain these benefits residents take on greater obligations than with a normal tenancy agreement or lease, to share the running and maintenance of the community. 2. Will there be workshop space, work opportunities and the sharing of skills within the community? Yes, we hope that in time there will be, when there are enough interested residents who want to make it happen. 3. Will there be good children’s facilities, play areas and the sharing of child care? We very much hope that residents will want to organise events of this sort. 4. Will there be access to community and educational events and other opportunities? 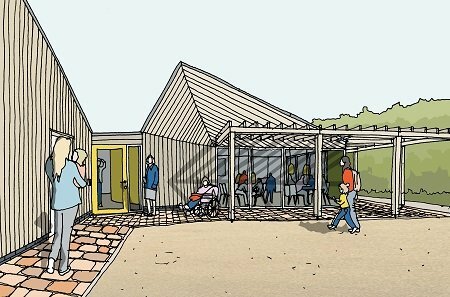 The site gives lots of opportunities for informal play for older children, and we anticipate a fenced space for really young children; it will be for residents to decide on the details. 5. How “green” is cohousing? Sustainable living is an important part of cohousing, and we encourage people to reduce their carbon footprint as much as possible. Ideally some people will work from home or locally and may be able to commute by bicycle or car sharing. Car ownership is limited to one space per household, unless alternative off-road parking is arranged. See our Transport policy. One big benefit of living in a cohousing neighbourhood means that we can expect many of our household bills to be lower than in an entirely independent household. In developing the new homes on the site we are aiming to build in as ‘green’ a way as possible using a design and materials that make a minimal impact on the environment. This could mean, for example, not having a washing machine in your own kitchen but using the shared laundry. We currently plan for air-source heat pumps to provide hot water and the small amount of heat the homes will need. We aim to grow as much of our own fruit and vegetables as possible. 6. Can my friends and family come to visit/stay? Of course! If you have room they can stay with you in your own home, or you might want to hire a guest room for a modest charge. 7. How are the rules regulated and enforced? We operate a lot on trust. However if the community perceives that someone is persistently not complying with the agreements a sanctions process will be put into play, outlined in our lease agreement and handbook. Ultimately a resident may be asked to leave. See our Pets policy. This is likely to limit the overall number of pets kept on the site. 9. What happens if I fall out with someone? In choosing to live here, you commit to making every effort to resolve disputes and differences as quickly as possible. Sometimes it may be necessary to ask someone else living in the community to act as a mediator. In serious cases we may appoint an external mediator. 10. How are decisions made? When making policy we operate a consent decision‐making process. This means we seek to find a solution that takes account of everyone’s views, and actively seek objections, because they can often improve the final outcome.